The advanced computer security software company , founded by Ashar Aziz, priced its initial public offering of 15.2 million shares at $20 per share in September, raising about $304 million after increasing its expected price range to $15 to $17 per share. Aziz owns about 10.91 million shares in the Milipitas, Calif.-based security company; that 9.3% stake on the close of the first day of trading in September was worth more than $392 million. 1. The company's flagship product solves a really hard computer security problem. It is able to stop hack attacks that were previously almost impossible to stop. 2. FireEye bought another security firm, Mandiant, for $1 billion. Mandiant was famous for uncovering links between Chinese hackers and attacks on U.S. companies. 3. With Mandiant, FireEye launched a cloud computing security service that competes with SourceFire. SourceFire is the company Cisco bought last summer for $2.7 billion. 4. The company beat expectations on its fourth quarter with revenue of $57.3 million, a beat by $1.26 million, and EPS of $-0.35, a beat by $0.03. 5. Some Wall Street analysts have been really gung ho on the company. Wells Fargo started tracking it a month ago, saying it was "a once in a decade opportunity to invest in a truly disruptive technology." The world has dramatically changed since the 1990s when Wintel ruled the roost. PC is no longer the dominant device. Smartphones and tablets have brought the era of mobile cloud computing where neither Intel nor Microsoft enjoy leadership position. Even developing countries like Pakistan are deploying cloud computing applications. A Google sponsored survey in Pakistan found that mobile computing is expected to overtake desktop computing this year. Several new and more innovative and powerful players have emerged to in this market. As more and more enterprises embrace cloud-based computing, cloud security is becoming a hot area for many entrepreneurs. This shift means over $2 billion annual market for cloud security vendors like Fireeye and Elastica. Researchers at Gartner forecast the highest growth to occur in cloud-based tokenisation and encryption, security information and event management (SIEM), vulnerability assessment and web application firewalls. Recently, a Silicon Valley cloud security start-up Ealstica was launched by Rehan Jalil, a Pakistani-American alumnus of NED University of Engineering, Karachi, Pakistan. Elastica received $6.3 million funding from Mayfield Ventures, a premier Silicon Valley Venture Capital firm. Several analysts have recently upgraded Fireeye to buy with the target price above $100. To fight corruption, Beijing should look to 'Failed State' Pakistan. One approach that might have mileage on the mainland, however, can be found in Punjab, Pakistan. Corruption in land transactions in particular reached such proportions in Lahore that the chief minister, Shahbaz Sharif, introduced a system, the Citizen Feedback Model, that would enable people to report corrupt transactions. The authorities created a platform to send a text to citizens who had dealings with local government offices, asking them about the quality of the service they had received, and, most pressingly, whether they had been asked to pay a bribe. Over 2.1 million text messages have been dispatched since 2010 and over 8,000 cases of corruption have been reported. From that, officers can create so-called heat maps, illustrating where bribes tend to be demanded and how much has generally been paid. The information isn't there solely to enable law enforcement to arrest corrupt public servants; the aims are more subtle. On the one hand, public servants who are suspected of feathering their own nests can be tested out by so-called "mystery customers". Corrupt officials can then be caught in the act. On the other hand, the very knowledge that the text message service exists is hopefully enough to channel the minds of some potential bribers. The system therefore has both carrots and sticks in it, as well as a degree of subtlety. The Pakistan system clearly can't simply be transposed on to the whole of China. It does, however, have the advantage of empowering citizens to take action. It also doesn't go against the ethos of the current anti-corruption drive. The Syrian conflict has been marked by a very active, if only sporadically visible, cyberbattle that has engulfed all sides, one that is less dramatic than the barrel bombs, snipers and chemical weapons — but perhaps just as effective. The United States had deeply penetrated the web and phone systems in Syria a year before the Arab Spring uprisings spread throughout the country. And once it began, Mr. Assad’s digital warriors have been out in force, looking for any advantage that could keep him in power. In this case, the fighter had fallen for the oldest scam on the Internet, one that helped Mr. Assad’s allies. The chat is drawn from a new study by the intelligence-gathering division of FireEye, a computer security firm, which has delved into the hidden corners of the Syrian conflict — one in which even a low-tech fighting force has figured out a way to use cyberespionage to its advantage. FireEye researchers found a collection of chats and documents while researching malware hidden in PDF documents, which are commonly used to share letters, books or other images. That quickly took them to the servers where the stolen data was stored. Like the hackers who the United States says were working for North Korea when they attacked Sony Pictures in November, the assailants aiding Mr. Assad’s forces in this case took steps to hide their true identities. The report says the pro-Assad hackers stole large caches of critical documents revealing the Syrian opposition’s strategy, tactical battle plans, supply requirements and data about the forces themselves — which could be used to track them down. But it is not evident how or whether this battlefield information was used. Billionaire engineer Ashar Aziz has purchased a 3.5-acre waterfront lot in Gables Estates for $15 million, or $98 per square foot. Miami-Dade County records show that Aziz, founder and vice chairman of the cybersecurity firm FireEye, purchased the property at 8525 Old Cutler Road in Coral Gables. An LLC tied to Aventura-based Kawa Capital Management is the seller. 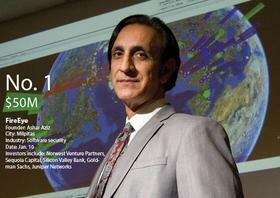 As of last year, Aziz owned nearly 11 million shares in FireEye, which he founded in 2004. Before that, he sold a data visualization company in 2002 to Sun Microsystems. Forbes estimates his net worth at a little more than $1 billion. As of Friday, FireEye stock was trading at $23.59 a share. The 152,932-square-foot property hit the market in October for $16 million, according to Realtor.com. Judy Zeder of EWM was the listing agent. The vacant lot sold in 2012 for $10.05 million, Miami-Dade property records show. Aziz joins other billionaires in the gated waterfront community, such as Mike Fernandez, who owns 6.6 acres at 1 Arvida Parkway. In March, former Serta International CEO E. Richard Yulman sold his Gables Estates home sold for $17.2 million. The seller, Kawa Capital Management, is an independent asset management firm with more than $656 million in assets under management. Co-founder Alexandre Saverin signed the deed transfer of ownership. Aziz also owns the 7,400-square-foot home at 590 Reinante Avenue in Coral Gables. He paid $5.3 million for that residence in 2013, property records show.